I have never understood some of the lies told about the University of Texas. They are lies that put the University of Texas in a group where things are not possible because of football. In all actuality, everything is possible because of football. To steal a phrase from the 80’s classic Dirty Dancing, “Nobody puts baby in a corner.” Texas should not get cornered either as a football only school. Ohio State is very good at having great football and basketball programs. Florida has done it. Notre Dame has done it. UCLA is doing it right now. Have people forgotten that Texas has done it? So tell me again why Texas cannot do it again. Do any of those schools love their football program more than basketball to the detriment of basketball? No. Texas is in Austin, has a great practice facility and will have another great one soon with the new arena and correlating practice facility. Texas is a great recruiting ground for basketball and region of the country means less in basketball because players are more apt to move far away from home for basketball than they are for football. Do not believe that fools that will tell you that the Texas fans will never show up. Do not believe the naïve people that believe the students will never show up. 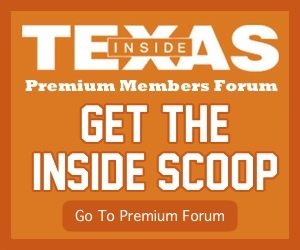 The Texas students do not want to show up and be sent to the rafters to watch the game when at every school around the country that cares about the environment has figured out how to get student on one of the side-courts. The Texas administration and even the media can bang on the fans all they want. This is not different than the baseball movie Field of Dreams. “If you build it, he will come,” was the famous line from that movie and ‘he’ are the fans in this scenario. It is Texas’ responsibility to build a great program. It is the University of Texas’ responsibility to build a great atmosphere. It is the administration’s responsibility to make the atmosphere inviting and exciting for the student body. It is Steve Patterson’s responsibility to create a schedule chalk full of home games that builds the brand, builds the loyalty, and encourages the environment that fosters a home court advantage that – let’s be honest – Texas has never consistently had. Texas can be everything that the Texas fans want a program to be. Can they be Duke, North Carolina, Kansas or Kentucky? No! But who can and who cares? That takes 75 years of history, focus, success and crappy football programs. There is absolutely no reason why Texas cannot be a consistent Top 20 team that makes a run in NCAA tournament on a consistent basis to the Sweet 16. 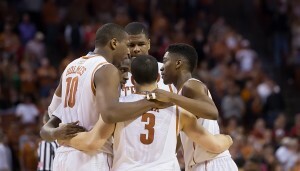 Yes, Texas can win a national championship is basketball. Anybody that tells you different is a defeatist and does not know sports, especially college sports.